On Monday, 11 February 2019, we will celebrate the International Day of Women and Girls in Science at ICMAB! 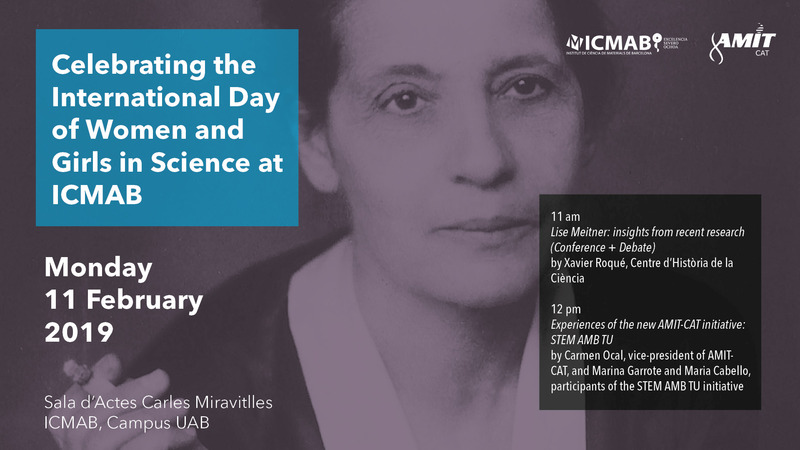 We have a full morning prepared with a seminar to discover who was and what did Lise Meitner do, followed by a presentation of some of the participants of the STEM-AMB-TU initiative from AMIT-CAT to encourage scientific vocations to young girls. Do you want to share this day with us? Xavier Roqué is Senior Lecturer in History of Science at the Universitat Autònoma de Barcelona (UAB). His research deals with the history of the modern physical sciences, and gender and science. He has recently published a new edition of A. Einstein's popular relativity book (La relativitat a l'abast de tothom, 2018) and edited De la Guerra Fría al calentamiento global. Estados Unidos, España y el nuevo orden científico mundial (together with Lino Camprubí and Francisco Sáez de Adana, 2018). At 12 pm, Camen Ocal, vice-president of AMIT-CAT (Associació de Dones Investigadores i Tecnòlogues de Catalunya) will introduce this association to us, and then, two participants of the STEM AMB TU initiative, will explain their experience in the programme. They are Marina Garrote, from the Centre de Recerca Matemàtica (CRM), and Maria Cabello, from the Institut de Microelectrònica de Barcelona (IMB-CNM-CSIC). We will also have a photocall in our hall, ready for you to take pictures! See you at ICMAB on 11F!